Welcome to the Chiron Pages! Here you can explore my unique approach to this centaur beyond the apparent dichotomy of wounded or wounded healer. I treat Chiron as the energy antenna within you, picking up energies in others and the world around you, stirring an emotional response from you. For me, wounding and healing are byproducts of the reality of being sensitive to energy and emotion. The prevalent apparent dichotomy that you can be either wounded or a wounded healer with Chiron isn’t the whole story, as we can learn to progress beyond attachment to the wound and relying on it for self-definition. This is a powerful approach to get you into your heart and heal what you’ve carried, but also to transform into someone choosing to employ the strength and wisdom that comes from compassionate acceptance of pain, sorrow, and other suffering. 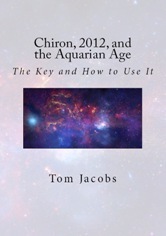 The full story on my approach is in the book Chiron, 2012, and the Aquarian Age: The Key and How to Use It. The book is an edited transcription of The Chiron Course, an 11.5-hour audio course. When I asked Ascended Master Djehuty (a.k.a. Thoth, St. Germain, Merlin, and Hermes) in early 2008 what would happen in 2012, his answers were all about Chiron as the key for humans to become healed and empowered as we learn about our true nature as energetic beings – consciousness that exists across time. His view is that healthy, emotionally-aware and -healed Chiron within us is the doorway into the Aquarian Age, a time of individuation and personal evolution we are transiting into now. 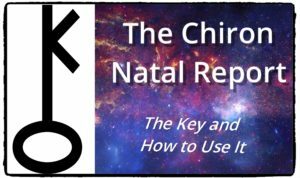 Read all about your own Chiron configuration in the new Chiron Natal Report, which explains your natal Chiron house, sign, and aspects, as well as transits and progressions to your Chiron and transits of Chiron to your natal placements for the next year.